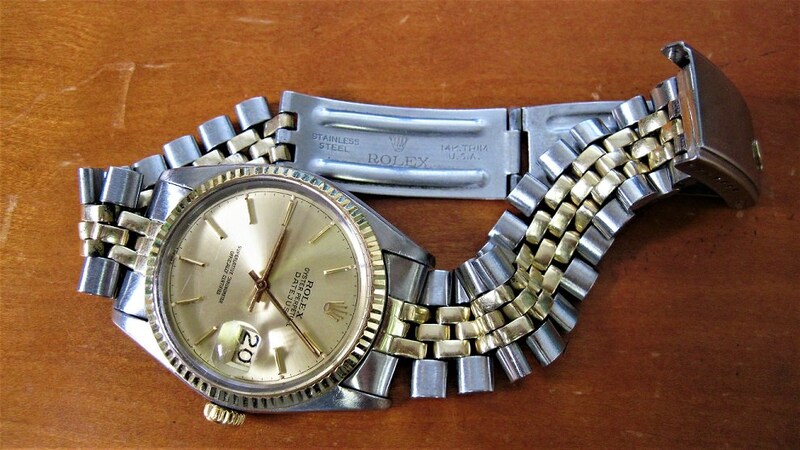 TimeZone : Rolex - Vintage » Looking for info on 1977 clasp on 16013, Large Crown? I'm not sure what the enthusiast call this style but I have not seen others on a 16013. Was this an optional fitment or is it a common sight on this particular vintage? I bought this from the original owner so I know it came from the Jeweler as is. Are these more rare? I posted this earlier but "lost" the posting. According to Ken Specht Rolex info in Wrist Watch guide #2, that type band was used in 50's and 60'. 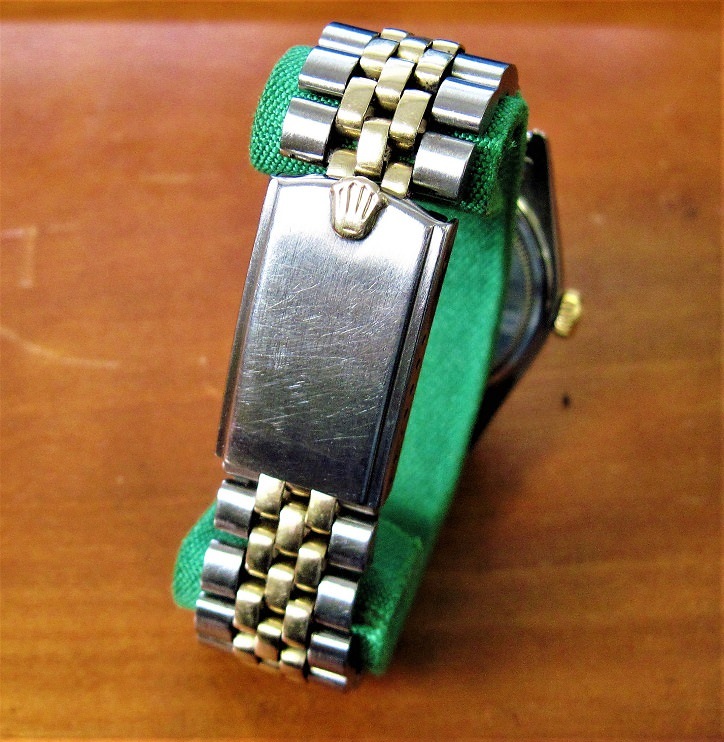 In 70' a flat style clasp was used without the lines around the edges. Its a USA band and its stretched. Thanks for the info! Yep it's a 1977 serial and of course it's stretched a little in 40 years of actually being worn, not a closet queen. I can attest that the "broken in" Jubilee bracelet is by far margins the most comfortable band I can imagine. I'd be totally dumbfounded how a more comfortable metallic band could be invented. It simply feels like silk against the skin and quickly warms to body temp. No sweating underneath, no hair pulling. It's the tops. Actually that clasp has been verified as the original and correct one as delivered with the piece. It was all original circa 1977 and had all the boxes and papers with it. It had actually been used, no safe queen, and it is reasonable for a 40+ yr old band, that was largely constructed from real gold to stretch some. I even lightly scuffed the face changing the spark plug on my old Ducati 900SS SP. Not a happy event but a memorable mark that almost polished completely out. I have since sold the watch to a very nice fellow at a commendable profit after owning it and enjoying it for nearly 15 years. It still kept fair time running a little slow, 1.5 min. per 24 hrs. It needed a tune up and cleaning which I disclosed to the new buyer. He was quite pleased as was I, the funds went to the purchase of a very nice restored BMW R75/5 Toaster motorcycle. Now for my next classy watch... perhaps an Omega, never had one.